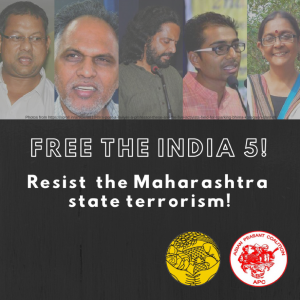 The People’s Coalition on Food Sovereignty (PCFS) and the Asian Peasant Coalition (APC) strongly denounce the attacks against Indian activists and people’s rights defenders in connection with the state terrorism being perpetrated by the Maharashtra government.Our Coalitions are enraged by the arrest of five Indian activists on 6 June 2018 on the basis of trumped-up charges for their “provocative speeches” that “incited” the violence on 1 January 2018 in Pune during the Elgar Parishad, the 200th anniversary commemoration protest of the Battle of Bhima Koregaon. These prominent Dalit rights activists who were among event organizers, namely Sudhir Dhawale, Surendra Gadling, Shoma Sen, Mahesh Raut, and Rona Jacob Wilson, were also red-tagged and accused as sympathizers of the insurgent Naxalites plotting the assassination of Prime Minister Narendra Modi. Prior to the arrests, offices and homes of activists and people’s rights defenders including the mentioned were raided in April. We are infuriated that the Maharashtra state is making use of this conspiratorial narrative to cover up its terrorism and legitimize the crackdown against activists and people’s rights defenders critical of its rule. The Elgar Parishad, which was organized by the Bhima Koregaon Shaurya Din Prerana Abhiyan coalition comprising 260 mass organizations, gathered thousands of India’s historically marginalized peoples – Dalit castes, Muslims, indigenous Adivasi, and “other backward classes” (OBC) on 31 May 2018. The peaceful assembly remembered the victory of the hundreds of lower-caste Mahar Dalits, albeit under the British rule, over the thousand forces of the higher-caste Peshwa Brahmins in the 1818 war. It was also a timely assertion, given India’s contemporary political context, of their struggle against oppression and discrimination by the reigning Brahmanical Hindutva regime of the Bharatiya Janata Party (BJP)-led alliance. We slam the collusion of the Maharashtra government with the right-wing organizations that actually instigated the riot, which incurred one dead and several injured. State police have targeted the organizers of Elgar Parishad in response to the cases filed by these groups, while their leaders who perpetrated the violence – Sambhaji Bhide of Shiv Pratishthan Hindustan and Milind Ekbote of Hindu Ekata Aghadi – are at large carefree despite the public clamor for their arrest. Our Coalitions condemn Maharashtra state and these right-wing groups for exploiting the outdated draconian Unlawful Activities Prevention Act (UAPA) as a convenient ground to charge and jail activists and people’s rights defenders based on fabricated links to Naxal rebels. This was already done in March 2017, when wheel-bound GN Saibaba and five others were sentenced for their alleged involvement with the Naxals in conspiring a war against the government. In reality, these personalities are vocal critics of the military’s Operation Green Hunt, the anti-Naxal campaign that has already incurred more than 2,000 civilian deaths since 2009. We express concern that more arrests and harassment of Indian activists and people’s rights defenders will follow in the coming days. These people are always at the forefront of the struggles of India’s marginalized peoples, who suffer from the unequal social relations distinctive in Indian society. They stand for food sovereignty, among other people’s demands, versus the corporate control over agriculture and food production, advancing the interests and welfare of the majority who remain landless and have no access to adequate food. We challenge the Maharashtra state to uphold Scheduled Castes and Tribes (Prevention of Atrocities) Act 1989 and Rules 1995 and hold Bhide and Ekbote accountable for their crimes. More importantly, we demand to stop the crackdown against Indian activists and people’s rights defenders. In particular, we urge for the immediate and unconditional release of Dhawale, Gadling, Sen, Raut, and Wilson.